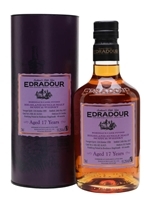 Available in a limited edition of just over 900 bottles, this Edradour 17 Year Old has spent its last 46 months in Bordeaux hogsheads. It offers aromas of blackberries, almonds and coffee, followed by flavours of ash, red fruit and tannin. The finish is long with blackberries, almonds and a hint of vanilla.